Create an inspirational space around the home, ideal for home workers, self employed entrepreneurs, health and beauty enthusiasts or simply a creative space for artists. 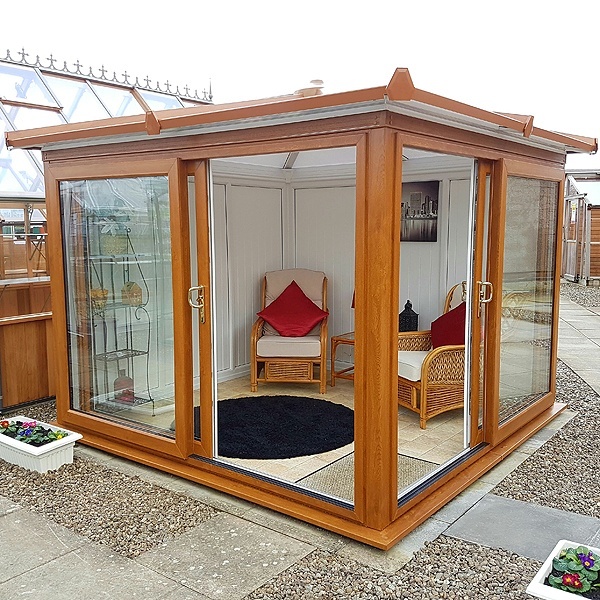 The Madison from Nordic Garden Buildings delivers you the perfect light, bright, inspiration space to develop your ambition for success. Use your Madison garden room to entertain, dine, relax, work - or even to grow exotic flowers and fruit! The Nordic Madison is designed with a ridge height of under 2.5m so that planning permission is only needed in special circumstances. Choose between black or grey. 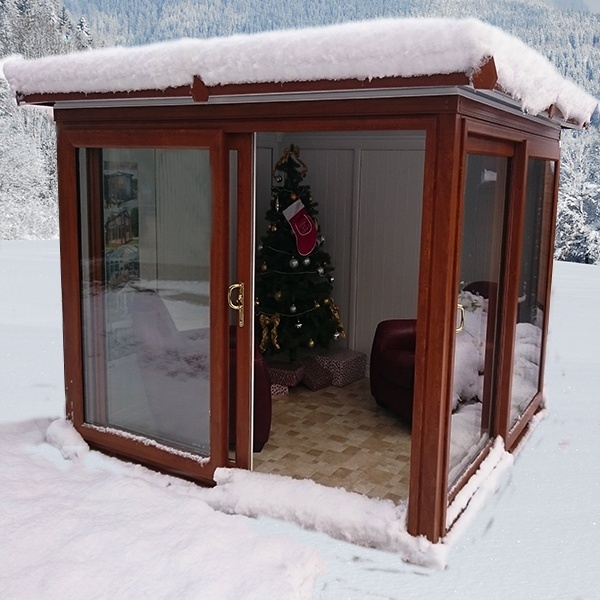 The Madison : double glazed with toughened safety glass, this is a warm winter environment or a pleasant corner to while away those summer evenings with the doors wide open. This building is finished with our Golden Oak option but the building is available in grey, white or black too. The two rear walls are always fluted white panelling which keeps the inside airy and bright. This is the smallest of the Madison range but still provides a full 3.61sq metres of useful space in this superb corner setting. Quoted sizes are internal so this building needs a 2.1m x 2.1m minimum base size. Grey external finish is an optional choice. It's important to note that the Madison is under 2.5m in height which means that planning permission is generally not required even if the building is situated close to the property boundary. 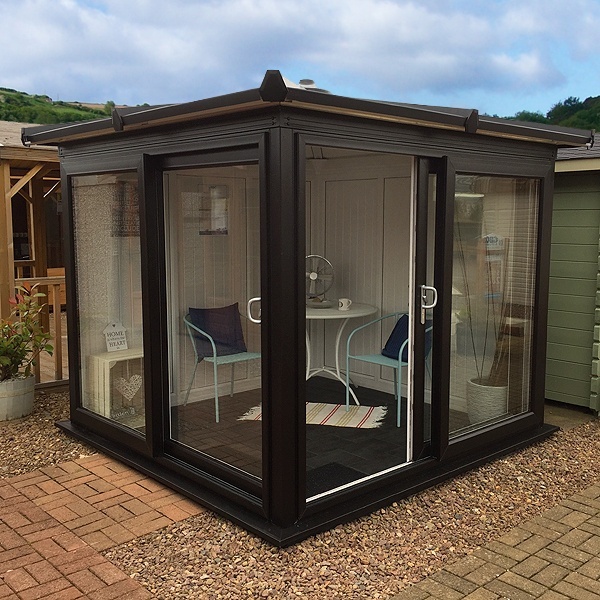 This 2.2m x 2.2m Madison is stunning with its black external framework. Quoted sizes are internal so this building needs a 2.4m x 2.4m minimum base size. 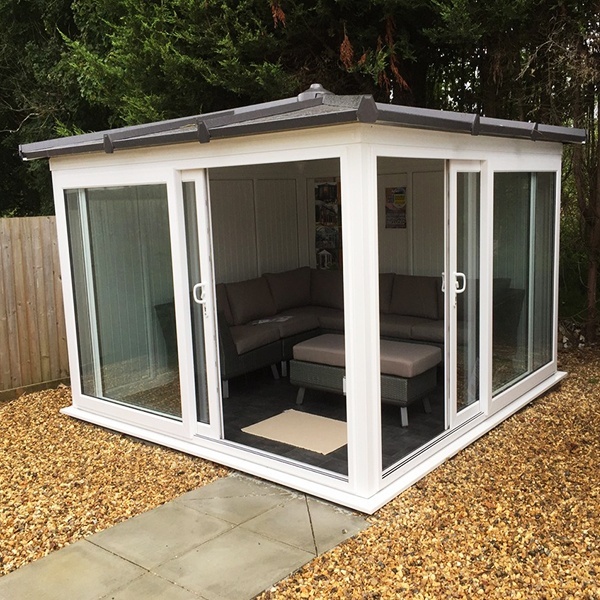 Stylish and modern, its high specification double glazing, PVC framework, and white interior make it a warm and inviting place to work or relax. 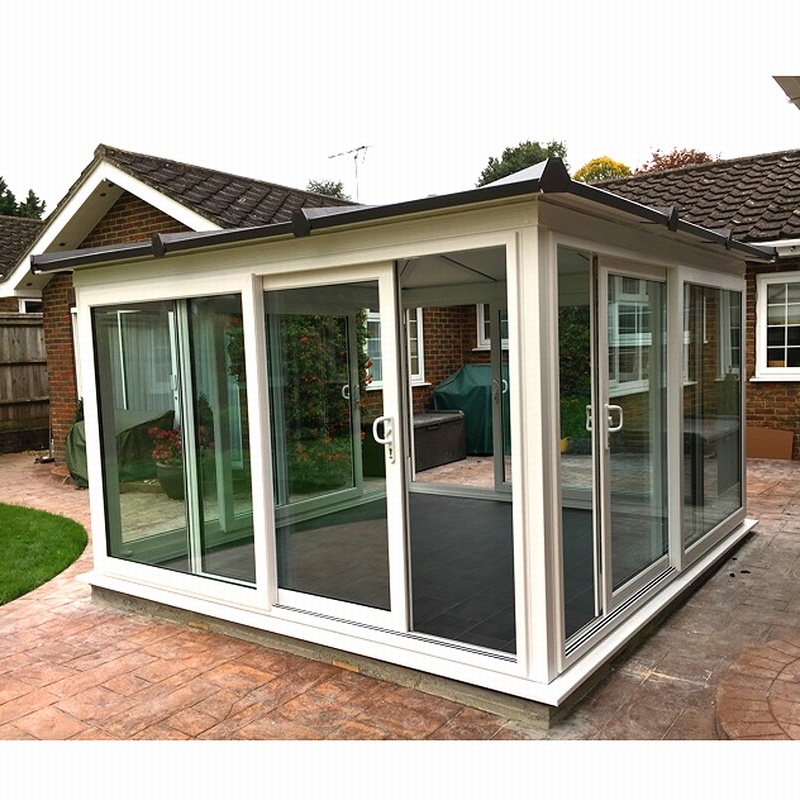 Light and bright, it's a fantastic place to while away a few hours any time of year with it's high specification double glazing, and PVC framework. 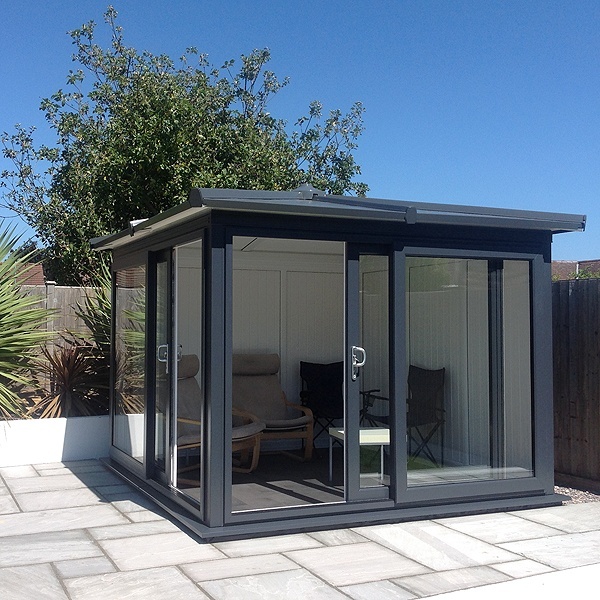 Constructed with our Grey finish, and with grey roof tiles, it's well on its way to giving many years of good looks and enjoyable use. 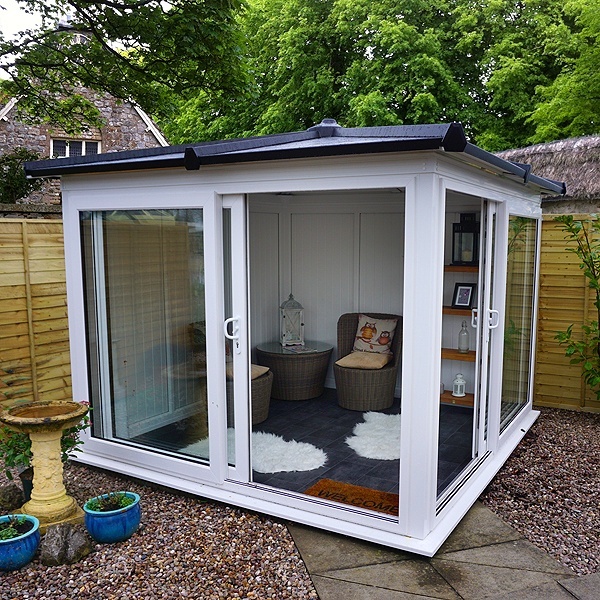 This Madison 3.1m x 3.1m version gives 9.61sq metres of floor area. It's the largest of the Madison buildings. It's pictured at our recently opened Nordic super-display at our Oxford branch along with 5 other superb buildings from the Nordic Range. Madison 3.1m x 3.1m . Doors all round. 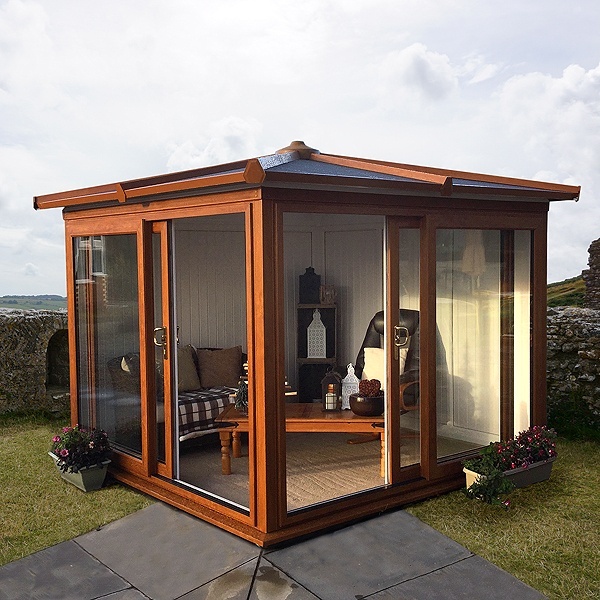 This is the largest of the Madison range which has been custom built to provide 360 degree views. To achieve this, 2 additional sets of doors have been added. The Nordic range was originally designed with Scandinavian countries in mind, and the Nordic Madison is no exception. 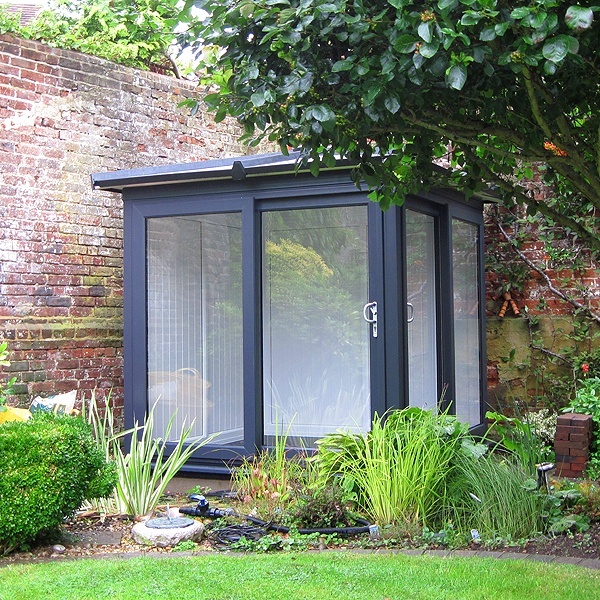 Perfect for year-round use with double glazing, thick PVC panels and low U-Values. Celebrate Christmas in style and comfort whilst you enjoy a mug of hot chocolate with friends and family. When you are buying a building that has to stand everything the British weather can throw at it, it's best to see it so you can examine the quality of construction, strength, and weatherproofing. At GBC you can do just this as we have display buildings to see at 35 locations around the UK. This one is at our site in Stirling in Scotland. Based at major Garden Centres you can combine your visit with lunch in the highly regarded restaurants at these stores ! The Madison is brand new for 2017 but has already generated a huge amount of interest. You can take a look at one by checking the 'where can I see one' section at the foot of this page. You would only expect the highest quality, secure handles and fittings on our Madison garden rooms and here they are illustrated on one of our Golden Oak external finished display models. The two rear panels in the Madison are finished in white PVC reeded panels which are easy to clean, and help to ensure the building feels light and airy all year round. The Madison has translucent polycarbonate in the roof as standard which allows light to flood through into the interior. Opal or Bronze options are available. There's a further option of a tile effect roof in black, grey or red, illustrated elsewhere in this gallery. This internal shot of the tile effect roof shows the smooth white panelling visible on the inside and the central roof boss. Outside it's available in a choice of different tile colours as shown elsewhere in this gallery. It's important to note that the building is under 2.5m in height which means that planning permission is generally not required even if the building is situated close to the property boundary. The clean lines of the tile effect Madison roof are illustrated here. You can choose from black (as shown) , grey or red tiles. This picture shows the attention to detail you can expect from your Madison... the corners have these attractive mouldings as standard ! This particular building has the optional tiled effect roof which is white on the inside.